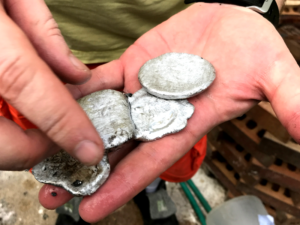 It took some time around having to finish homework and kid things and then the stupid rain… but finally, we got the foundry finished and cured, and today we did our first test batch of aluminum! 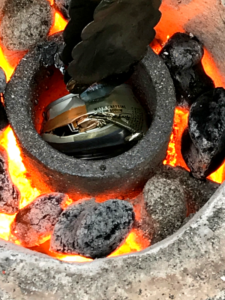 This is a very basic, inexpensive foundry, mainly so that we can test our preferences. 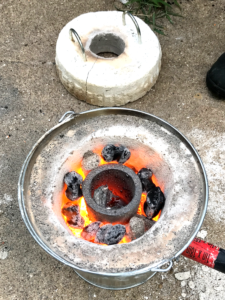 It’s a simple steel bucket with plaster of Paris and sand for the refractory, and that’s just normal household charcoal. The steel pipe is connected to a longer PVC pipe with a blow dryer at the end, acting as the bellows. 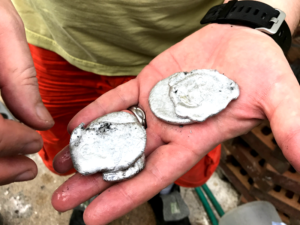 So, those ten cans came out to about 110 grams, which is about 11 grams per can. That’s not bad, considering most of my initial designs wouldn’t weigh more than 30 grams on the outside. Now I need to run out and get lighter fluid so we can do it again tomorrow. Things are happening! The polymer clay gets here tomorrow as well, so the proper sculpting can begin!